AirAsia India announced today Delhi as its second hub, after Bangalore. Delhi will also serve as a base for the airline, while Bangalore will remain the home base. Assuming that the airline will start flying between Bangalore and Delhi, the airline will for the first time begin flying on a Category I (Cat I) route, as defined by the prevalent route dispersal guidelines (RDG). Flying on a Cat I route will now oblige the airline to deploy a minimum percentage of the Cat I route capacity on Category II, IIA and III routes. Capacity is measured on an available seat kilometer (ASKM) basis. Every 180 seat flight between Bangalore and Delhi adds approximately 3,42,000 ASKM. This makes the choice of Delhi as a base very important. Category II (Cat II) routes are routes which were traditionally looked upon as ‘loss making’ routes. These are routes that connect the mainland to the ‘neglected’ north-east, far north, and the islands that make up Lakshadweep and the Andaman and Nicobar Islands. (Please note that ‘neglected’ is a harsh word, but that’s how the ministry looks upon these regions as far as air connectivity is concerned). 10% of the Cat I capacity must be deployed on Cat II routes (To be soon revised to 20%). Had AirAsia India flown to Port Blair from Chennai or Bangalore, this requirement could have easily been met. AirAsia’s Airbus A320s cannot operate into and out of Agatti’s short strip. To cater to a Cat I route and Cat II & IIA routes, the northern part of India is a wiser hub. All the routes AirAsia India flies today are Cat III routes, as per prevalent RDGs. By having a hub at Delhi, AirAsia India can fly early morning flights from Delhi to Bangalore, which can be mirrored by early morning Bangalore – Delhi flights. Similar flights from either destinations may be flown in the evening. This requires one A320 to be based at Delhi, to start with. If such a strategy is followed, each aircraft will fly a minimum of 2 flights on the Bangalore – Delhi/vv route. Each flight is planned for 2:45 hrs, which will total upto 5:30 hours of utilisation per aircraft on this city-pair, leaving a maximum of around 7hrs of utilisation for other stations. We feel that the airline may fly a 3x Bangalore-Delhi one way, per day, of which at least 2 shall be direct flights. Flights to Delhi are not expected before May 2015, and perhaps not before mid-May 2015. Deploy Cat II & IIA capacity. Flights between Delhi-Jammu-Srinagar or Delhi-Guwahati-Bagdogra or Delhi-Guwahati-Agartala may be flown for Cat II and Cat IIA capacity. Delhi-Jammu-Srinagar seems to be the most likely set of cities to be flown first. If the airline is innovative enough, it may make the most of its patterns to fly underserved routes. I am obliged to not exercise my creativity in suggesting routes. AirAsia India presently flies three aircraft, and one of the three patterns flown everyday has a poor utilisation of just 7:50 hrs (see above). It is in this pattern – the third pattern, that two flights to Vishakhapatnam may easily fit in (as published in the DGCA’s Summer Schedule), with perhaps slight schedule changes. Opening the Delhi-Bangalore route will require two additional aircraft: one based at Bangalore, and the other at Delhi. Further, as per CAR Sec 3 AT series C Part II, operators “will be given one year’s time from the date of securing operator’s permit, to have the fleet size of five aircraft”. AirAsia India secured its AOP on May 7th, 2015, and a 5th aircraft is necessary to meet regulatory requirements. 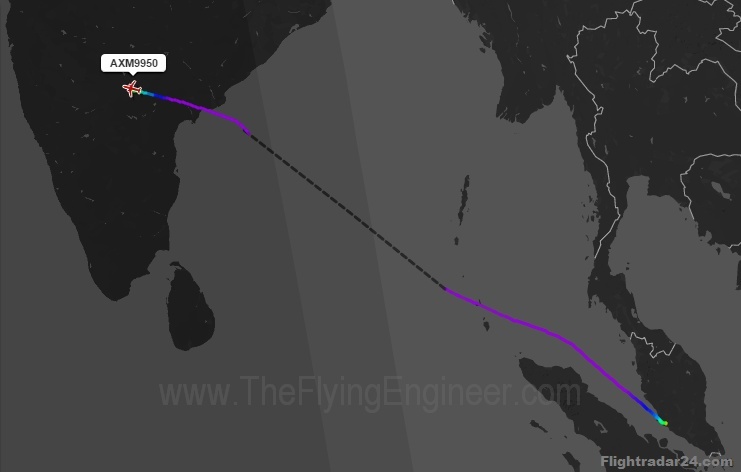 Today, at around 11:00hrs IST, AirAsia India’s 5th aircraft flew into Hyderabad from Kuala Lumpur. The aircraft is a used Malaysia AirAsia A320-216 (9M-AHU) without winglets, and is around 5.5 years old. The aircraft is AirAsia India’s second, non-winglet A320, after the 7 year old A320 which was unveiled to the public on 21st March in the JRD Tata livery (see image on top). Both aircraft are yet to start flying commercially for the airline. The first three aircraft have winglets. If the airline is prudent with its fuel burn, only the winglet equipped aircraft (VT-RED/ATF/ATB) will be deployed on the BLR-DEL vv route. Thank you to @ATCBLR on Twitter for posting the 5th aircraft’s arrival. Last year, Mittu Chandilya, CEO AirAsia India had announced Goa as the second hub, with the induction of the 4th aircraft. He had also mentioned that the airline will keep off Delhi and Mumbai. The airline last operated flights on the Bangalore – Chennai route on 31st March 2015.